The practice of issuing trading stamps was first started in the 1890s by L. H. Parke, a Philadelphia and Pittsburgh manufacturer and distributor of food products, under the name Parke's Blue Point Trading Stamps for customers who purchased their products. It grew with the spread of chain petrol stations in the early 1910s and the new 'supermarket' chains in the 1920s and reached its peak popularity from the 1930s through to the 1960s. U.S. brands included S&H Green Stamps, Top Value Stamps, Gold Bond Stamps, Plaid Stamps, Blue Chip Stamps, Buccaneer Stamps, Gold Strike Stamps, Texas Gold Stamps and Mahalo stamps in Hawaii. In the early 1960s, the S&H Green Stamp company claimed to print more stamps annually than the US government. By the 1960s, trading stamps had started to spread to other countries. 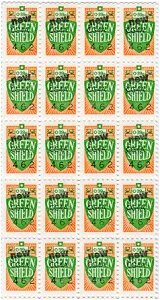 In the UK, entrepreneur Richard Tompkins purchased the name Green Shield from a luggage manufacturer and founded Green Shield Stamps in 1958, building a headquarters office block in Station Road, Edgware, Middlesex, in the early 1960s. 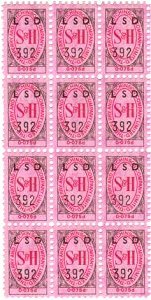 By 1963 Green Shield stamps were given away by many small retail outlets and petrol filling stations, but the business really grew when Tesco founder Jack Cohen, who saw it as a significant retail traffic builder, signed up with them in that year, shortly after competitors Fine Fare adopted S&H Pink Stamps (a UK operation of S&H Green Stamps). 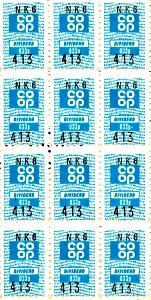 By 1965, the British Co-operative movement was also offering trading stamps as a means of allocating dividends to its members and CWS launched the national Dividend Stamp scheme in 1969. Other trading stamp schemes included Blue Chip and the short-lived King Korn operation, as well as many, more localised, retail outlets who produced their own. 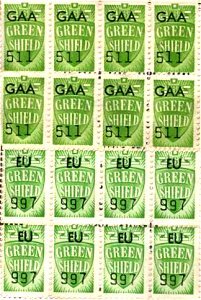 Green Shield Stamps could be found almost everywhere in 1960s Britain. Participating retailers gave you stamps, depending on the value of your purchase, to stick in a book. Once you had collected enough you could exchange the completed books for gifts advertised in a catalogue, or available for viewing at redemption outlets. 'Gifts' included things like a Regentone 19" television, which you could get for 88 books, or the Kodak Brownie 8 Movie Camera which was on offer for 13¼ books, but generally the gifts within the scope of the normal 'collector' were much more modest. During the 1960s, Tesco had lobbied Parliament to have RPM (Resale Price Maintenance) abolished, its efforts supported by Edward Heath. RPM had forbidden supermarket chains, who could buy in bulk, from undercutting the prices of smaller shops, so protecting smaller retailers. The major chain retailers such as Tesco got around this by issuing stamps with purchases, effectively a discount. In 1964 Parliament in the UK passed the Resale Prices Act, abolishing RPM, and also introduced The Trading Stamp Act of 1964 which allowed stamps to be redeemed for cash and, for this reason, stamps issued after this date bore a nominal 'face value'. The stamps even found their way into popular culture - in The Beatles' film 'A Hard Day's Night' (1964), John Lennon proclaims "Don't worry, son. We'll get you the best lawyer green stamps can buy." 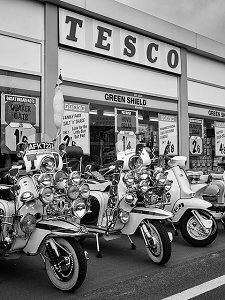 Tesco abandioned the Green Shield stamp business in the early Seventies, leaving petrol filling stations as the main suppliers, often offering double, triple, quadruple and even greater multiples of stamps to attract customers. Green Shield Stamp catalogue shops began to offer part stamp redemption and part cash for goods, and the proportion of cash accepted was slowly increased until goods could be purchased outright without the need for any stamps at all. At this point, in 1973, Richard Tompkins converted the Green Shield Stamps catalogue stores (where stamps were redeemed for products) to Argos, the retail catalogue outlet. 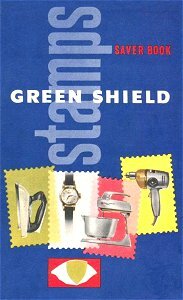 Green Shield eventually suspended the bulk of their operations in 1983 but did not completely discontinue the stamps until 1991.